Philadelphia 76ers guard Jimmy Butler (23) and center Joel Embiid (21) celebrate a victory against the Boston Celtics at Wells Fargo Center. Starting on the day Jimmy Butler arrived in Philadelphia, it was assumed the Sixers would go as far as the mercurial star and Joel Embiid could take them. 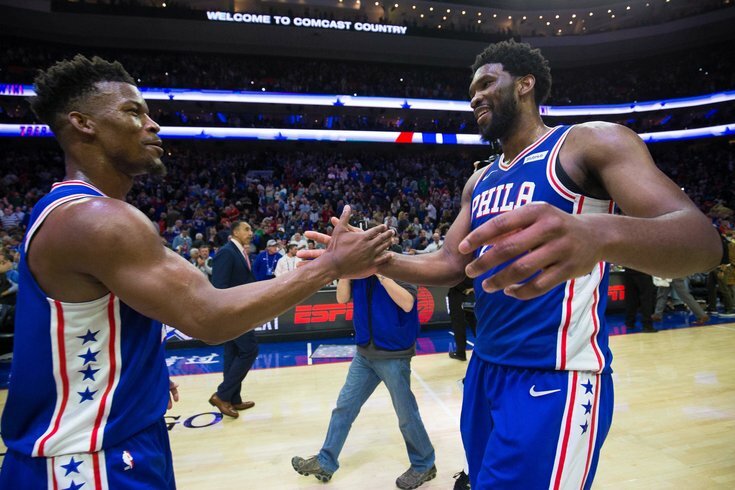 There was an expectation they would be joined at the hip, with that duo working the two-man game and playing alongside one another when the Sixers stagger their stars in bench lineups. Pick-and-rolls for easier Embiid looks? Sounds great. That hasn't exactly been the case in practice, and with Butler playing most of his bench minutes alongside Tobias Harris these days, the two-man game we all expected hasn't necessarily been there. But an understanding has emerged between these two in recent weeks, and a pre-game conversation between the two stars set the stage for their victory over the Celtics on Wednesday. "Quarters one through three, I was tired as I don't know what," Butler told reporters after the game. "And I asked Jo before the game, please just get us to the fourth, and I'll do what I'm supposed to do in the fourth quarter. He did a great job of doing that along with everybody else, and I just made some shots in the fourth." "I told him that I needed him tonight, that I needed this win," Embiid added. "He's our best closer, got to put the ball in his hands in the fourth...he showed up and in the fourth he was fantastic." This isn't a diss of either guy or dissection of their character — it has not been easy getting to the point where that conversation takes place and is received well on both sides. They're both prideful men who excel at different things in different styles, and it's often harder to lean into one's style without pushing the other to the side. Every game, every play call, and every conversation comes attached to that reality. But on Wednesday evening, Butler and Embiid's performances showed a level of maturity and respect that is integral to winning titles, or at the very least going deep into the playoffs. It all started with Embiid, who carried a group on the second half of a back-to-back through a lifeless first half. When Embiid says he "needed this win," he meant it. He's well aware of what people say about Boston's stranglehold of this matchup, and particularly what they have to say about Al Horford's defense against him. Embiid walked the talk on Wednesday — he had 18 and 11 by halftime, and an early altercation with Marcus Smart in the third quarter only seemed to add more fuel to his fire. He lived at the line all night, knocking down 20 of his 21 free throws. So what was the secret after plenty of misery in the past? Film prep, which Embiid claimed was a big part of his progress against a team that has held him down in the past. "One of the things I've been watching playing against them, I kind of shy away from being physical," Embiid said. "Just watching film, I knew that I had to come out and be extra physical and set the tone." Prior to the game, Brett Brown rejected the notion that anyone had Embiid's number, despite the fact that the statistics painted a clear picture in the Horford matchup. Brown often refers to a concept they call "0.5 mentality," suggesting a decision needs to be made in that amount of time, and while it is a teamwide emphasis, he has stressed that with Embiid in particular. On the flipside of the speed equation is Butler, who lives for the moments when the game slows down and he can let the game open up for him. That, at least, is what his teammates seem to believe is the key to getting him going in the fourth quarter. "I think he's more comfortable sort of in that static set when we're playing sort of at a slower pace. There's a real value in having someone who's capable of making plays against a set defense, someone who can shoot over the top of guys and really take advantage of mismatches," JJ Redick said after the game. "I don't know that you want to play that way for four quarters, but certainly at times going down the stretch there's value in that." What may get lost is his playmaking down the stretch, and that would be a mistake. The same size Redick believes helps Butler as a shotmaker pays dividends when he needs to find the open man in crunch time. Boston made it a simple read on this look, but it would have been easy for Butler to get tunnel vision with the way he had it going late. Instead, his head stayed up long enough to give Harris a bunny at the rim. This win, combined with Sunday's victory over the East-leading Bucks, gives the Sixers something powerful heading into the playoffs — belief. As Ben Simmons noted after the game, it is one thing to think you can play with anybody, and the Sixers do, but it's quite another to put that result on paper and make it real. We've spent a lot of this season talking about what this Sixers team looks like on paper. Finally, we're beginning to see what it can be on the hardwood. It's pretty scary.